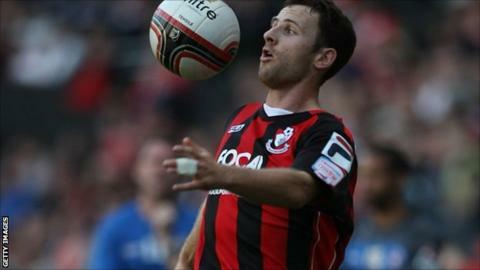 Bournemouth manager Paul Groves says there have been no bids for Marc Pugh and is hopeful the midfielder will remain at the club past Friday's 23:00 BST transfer deadline. Pugh, 25, has told the club he will not be signing a new contract and has less than one year left on his current deal. He has been linked with Burnley but there has been no official interest. "We've had no formal bids, so there's no change with that respect," Groves told BBC Radio Solent. Pugh announced his decision not to sign a new deal in June, adding he wanted to play in the Championship. But despite wanting to leave Groves says there has been no issue with Pugh's professionalism. "Marc is somebody we have spoken about before, we are happy with Marc and we want to keep him," added Groves. "But you can never guarantee with the madness of deadline day that he will stay. "The club do not need to sell him, I've spoken to him and he is happy, he has said he is ambitious and you've got to admire that."